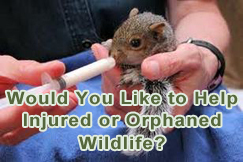 We are a 501(c)3 non-profit, grass roots organization with experienced and licensed wildlife rehabilitators that rescue, rehabilitate and release injured and/or orphaned animals. Your contribution will go exclusively to support animals with formula, medication and proper care. Since we are a grass roots organization, our most critical need are funds to purchase formula and medications. Puppy Chow, nesting boxes for squirrels, cage builders, fleece blankets and paper towels will always be appreciated.